To assign an icon to an window just select "General Appearance > Icon File". Problematic here is that Glade only shows image files located in the same folder as the Glade file even if an image from another folder is chosen. Headerbars were introduced in GNOME 3.10 and unite titlebar and toolbar. Besides title and subtitle there is room for widgets such as buttons or menus and client side window controls. A headerbar is optional. To make use of it "General > Appearance > Client side window decorations" has to be activated if not set yet. This prepares a reserved container area in the upper window area to add the headerbar widget in. If a headerbar is placed out of this specific area a regular titlebar is generated in addition to the headerbar. GtkApplication provides functions to define individual commandline options of the applications (Handling command line options in GApplication). Options are added by the add_main_option_entries(entrylist) function. The entries must be GLib.OptionEntry formatted which requires a bunch of parameters. An option can have a one character synonym ("a printable ASCII character different from ‘-‘" to be precise), the short name. Lokking at the option --help this commonly is -h.
The short_name variable of OptionEntry ist surprisingly integer. The not very obvious solution here is to pass the character's decimal code, p.e. 97 for "a". An error message will be thrown when trying to pass invalid numbers. Options without a short code get a value of 0. 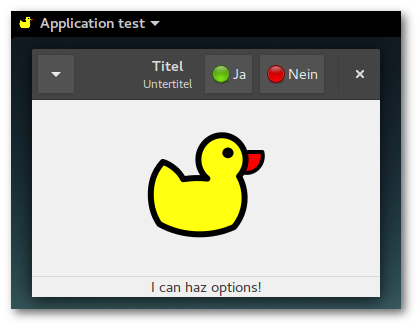 The "handle-local-options" signal of Gtk.Application handles commandline options. If the signal is connected the signal is emitted before the "startup" signal. The option --help is always available and lists all defined options of the application and their descriptions.